Congress President Rahul Gandhi on Monday said if his party comes to power, it will implement a “ground-breaking” Nyuntam Aay Yojana (NYAY), under which 20% of the poorest families of the country will be entitled to up to ₹72,000 yearly. Describing the scheme as unique in the entire world, he told a press conference in New Delhi that the minimum income guarantee scheme will be implemented in a phased manner as part of the “final assault on poverty”. “For the last five years, people have suffered a lot, particularly the poor people. We have decided to give NYAY (Nyuntam Aay Yojana) to the poor people of the country. As part of the minimum income guarantee scheme, we are going to announce historic measures,” he said. 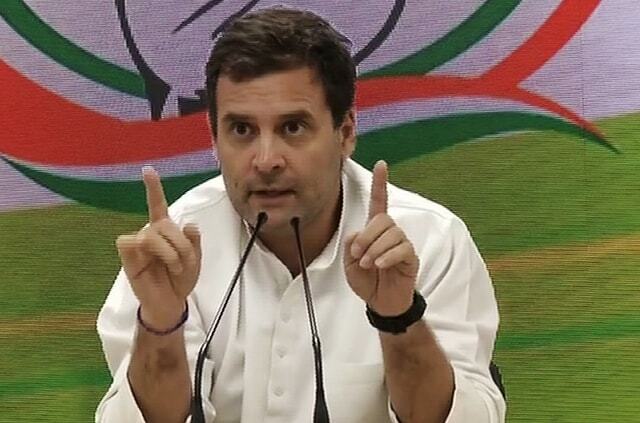 “Congress guarantees that the 20 per cent poorest families of the country will be given Rs 72,000 per year directly in their bank accounts,” Rahul said, about the scheme regarding which he had first spoken at a rally last month. The Congress leader said 5 crore families and 25 crore people will directly benefit from this scheme. Explaining the contours of the proposed scheme, he said the cut-off income will be Rs 12,000 per family per month and if any family earns less than that, the remaining amount will be a top up to bring it to the level of Rs 12,000 per month. The Congress chief said his party has done proper analysis and the scheme will be fiscally prudent, like the MNREGA, brought by the previous UPA government. “The poor people belonging to every religion, caste, language will be entitled to up to Rs 72,000 crore per year directly in their accounts. If PM Narendra Modi can give money to the richest of the country, Congress will give money to the poorest,” he said. “The scheme will be implemented in a phased manner, there will be a pilot project and then it will be implemented. But it is Congress party’s promise and it will be fulfilled,” he said. He said it was a “ground-breaking idea” and it was a “historic day”. “The final assault on poverty is beginning,” he added. He said the scheme will be implemented like the party fulfilled its promise of farm loan waiver in Rajasthan, Madhya Pradesh and Chhattisgarh, after he had made the electoral promise.